Leinster Lightning are the 2014 Newstalk Inter-Provincial Championship winners after their rain affected game with Northern Knights petered out into a tame draw at Waringstown. Craig Ervine scored a quite brilliant 131 from 176 balls (15 fours, 1 six) sharing a fourth wicket partnership of 192 with Knights skipper Andrew White. White - Ireland’s most capped player - is renowned as a specialist in the longer form of the game, and once again showed his batting prowess, making an unbeaten 87 from 146 balls (10 fours) before declaring at lunch with the Knights on 312 for 4. Leinster found the track to their liking as well as the bat continued to dominate the ball on the benign track. Fintan McAllister fell for 28, but half centuries for Kenny Carroll (77) and Ben Ackland (54) saw Lightning advance to 205 for 3, before John Mooney’s declaration saw the game called off as a draw at 5:20pm. Lightning are back in action on Saturday when they face NW Warriors in the 50 over competition. Play at Strabane gets under way at 10:45am and admission is free. Northern Knights (8pts) drew with Leinster Lightning (6pts). 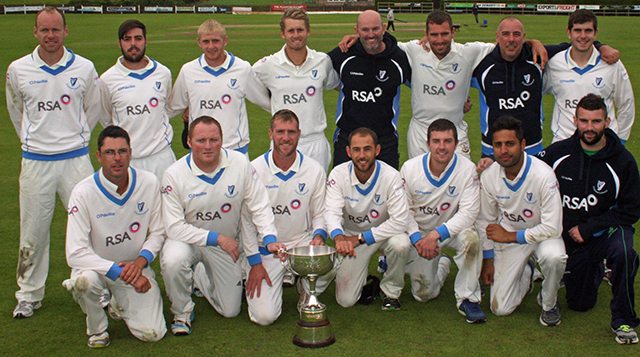 Leinster Lightning are the 2014 Newstalk Inter-Provincial Championship winners.